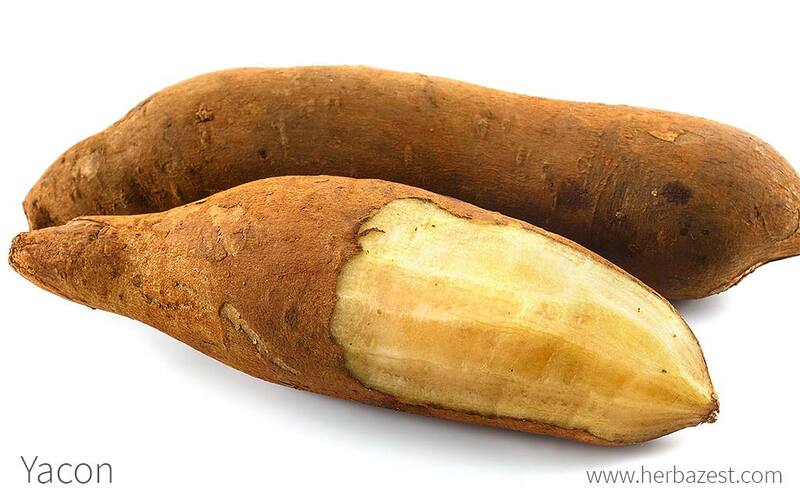 Yacon is a tuber similar to the potato or jicama that is native to the Andean region of South America. Yacon is gaining attention around the world for its numerous health benefits, but it has long been consumed by the indigenous people of South America. Native to the subtropical, mountainous regions of the South American Andes, the first large concentrations of yacon plants is thought to have naturally grown near human civilizations of the region. This is due to the species preferring areas free of vegetation, similar to the ones indigenous Americans settled using slash-and-burn agricultural methods on steep mountainous slopes. Although yacon has been consumed by Andean highlanders for centuries, it wasn't until the 1980s that it received the attention of the scientific community, and its medicinal properties were investigated and put into value. Managing diabetes. The yacon tubers help manage diabetes by reducing glucose levels, and are often used as an alternative to cane sugar and processed sugar. Improving digestion. The compounds in yacon root also have a prebiotic effect, which helps with digestion and improves colon health. Additionally, the use of yacon root for weight loss diets is becoming increasingly popular since it is a natural sugar replacement, and it is believed to help reduce inflammation. Although further studies are necessary, yacon properties have also shown potential for treating kidney problems and rejuvenating skin. 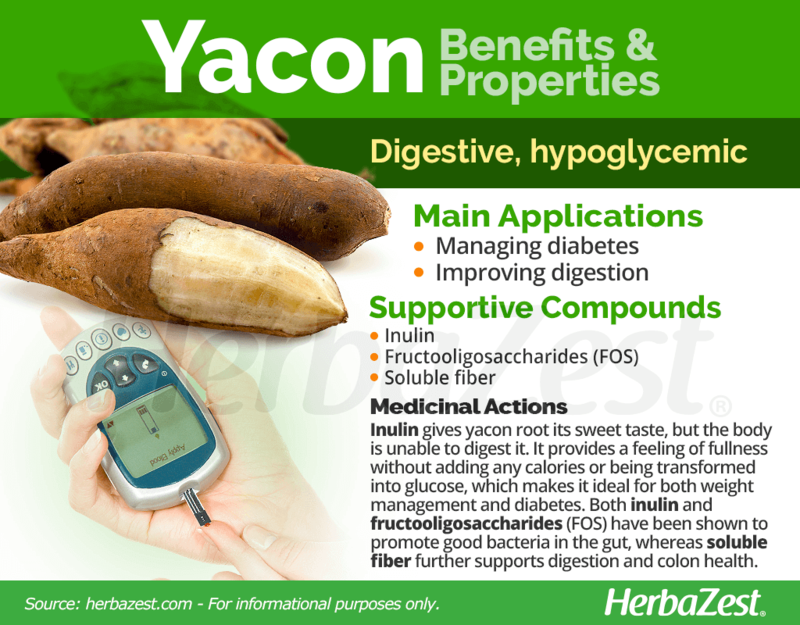 Yacon is rich in inulin and fructooligosaccharides (FOS), both of which have been recognized for enhancing the growth of good bacteria in the gut. 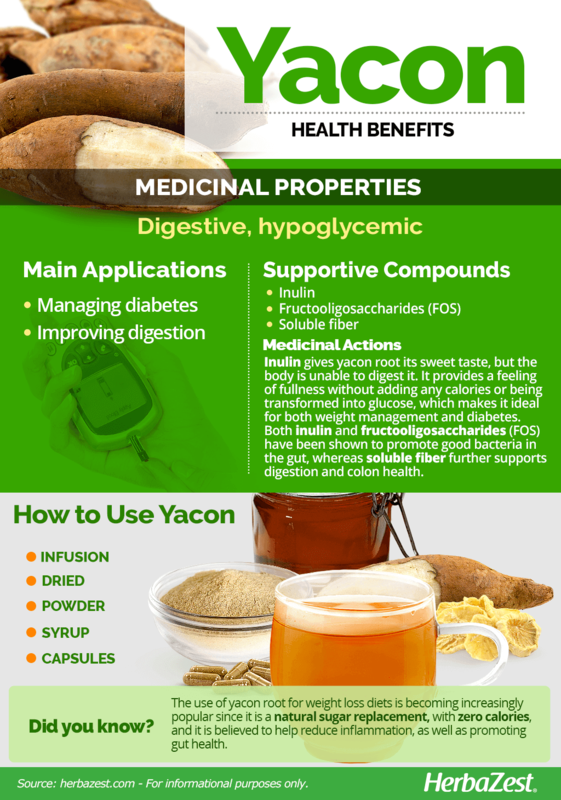 This is why the yacon tuber is considered as a prebiotic sugar replacement. The inulin it contains has a sweet taste, but the body is unable to digest it. Therefore, it passes through the digestive system, providing a feeling of fullness without adding any calories or being transformed into glucose, which makes it ideal for both weight management and diabetes. The yacon root is a good source of soluble fiber. Herbs that are consumed as alternative sweeteners are stevia and lucuma, whereas cinnamon and goldenberry also contribute to reduce blood sugar levels, thus helping manage hyperglycemia and diabetes. Herbs that support colon health are psyllium and flax. Yacon is safe when eaten as part of a balanced diet. Few to no side effects have been observed in studies aside from mild digestive disturbances due to overconsumption. People with irritable bowel syndrome (IBS) or small intestinal bacterial overgrowth (SIBO) should be aware that consuming yacon, as well as any other source of fructooligosaccharides (FOS), may cause them gastrointestinal discomfort. The most common way to consume yacon root in its native region has always been raw, due to its sugary-sweet flavor and pleasant crunch. In places where the Andean tubers are not available, yacon can be found in the form of natural pure powder and dried chips as well as in supplemental forms, such as capsules, tea bags, and syrups. Infusion. 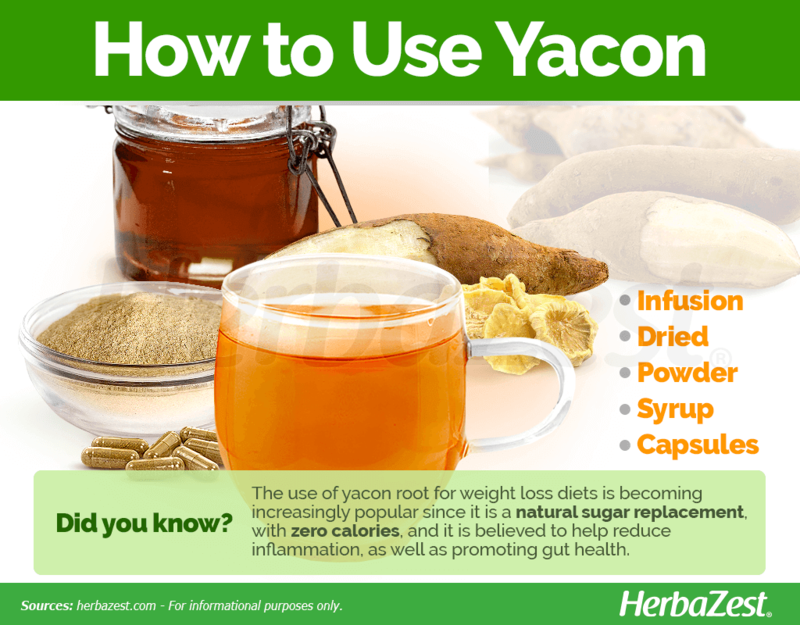 This is a popular way of consuming yacon to support blood sugar balance and digestive health. Dried. In this form, as raw chips, yacon can be eaten as a tasteful snack or brewed into an herbal tea for lowering glucose, supporting digestion, and reducing food cravings. Powder. After being dried and powdered, yacon can be added to juices, smoothies, and even baked goods in order to increase fiber content and reduce sugar intake. Syrup. This herbal preparation provides yacon root in concentrated amounts for beneficial control of sugar intake and diabetesmanagement. Capsules. As a daily supplement, for blood sugar regulation or digestive purposes, yacon capsules are a widely available option. Yacon root products are not yet widely available; however, some health food sections of grocery stores carry pure powder, syrup, and tea made of the yacon plant. Fresh and dried varieties are seldom found in certain Latin American markets throughout the year. So far, the best way to buy yacon, in both natural forms and supplements, is through online retailers. Pure yacon powder can be found in some grocery stores and health food stores as well as via online retailers. Furthermore, the dried roots of yacon are available as chips in certain organic markets. Yacon capsules and tablets offer a consistent dose of inulin, which be taken as both a prebiotic and a hypoglycemic agent. Online retailers offer the most variety of brands, which are available at a range of price points. Likewise, yacon tea and syrups can be easily found through online retailers and in some organic stores or health food stores. Subtropical environments produce the best yields of yacon root. High altitudes between 3,000 - 11,500 feet (900 - 3,500 m) provide cold nights that spike the yacon plant propagation, but they are not necessarily required for a successful yield, and it is possible to grow this species in many different climates. Yacon can survive chills as low as 30°F (-1°C) and heat as high as 104°F (40°C). This species will thrive in a sunny area, with a temperate climate. Yacon plants are propagated from cuttings obtained from the “crown, ” a ginger-like root structure where the edible tubers emanate. At least three inches (8 cm) between the plants are necessary for them room to grow comfortably. It requires a regular water supply and a fertile soil with a good drainage. It is best to plant yacon at the beginning of the rainy season or springtime months. Yacon is a fast growing crop, and will be ready to harvest in about five months. This Andean tuber is virtually free of pests and diseases. Yacon (Smallanthus sonchifolius) is a flowering perennial that can reach three feet (1 m) tall and produces large, broad leaves and star-shaped blooms, with small yellow petals, the latter of which only appear briefly at the end of the growing season. The long, tuberous roots are where the major concentration of nutrients lies, and they can reach up to 10 inches (25 cm) in length by four inches (10 cm) in diameter, with striated colors. Yacon (Smallanthus sonchifolius), belongs to the Asteraceae, or sunflower family, which contains over 23,000 species spread out over 1,620 genera. The family can be found throughout the world and contains numerous different economically-important herbs, including, artichoke (Cynara scolymus), chicory (Cichorium intybus), dandelion (Taraxacum officinale), and lettuce (Lactuca sativa). Many of its species are popular in the herbal tea world. The genus Smallanthus is comprised of about 21 species of perennial herbs, mostly native to southern Mexico, Central America, and the Andes in South America. However, six species are very similar to S. sonchifolius and can be classified as a type of 'yacon group': S. connatus, S. macroscyphus, S. riparius, S. meridensis, S. suffruticosus, and S. siegesbeckius. There are thought to be approximately 20 - 30 varieties of yacon plants grown throughout Central and South America today, though their differences are generally as slight as the color of the root's skin and flesh, which can range from cream to red to purple. As early as 1,000 CE, the yacon plant was used as a food source and herbal medicine as well as a symbolic offering during religious ceremonies by indigenous peoples of the Peruvian and Bolivian Andes. The Incan and pre-Incan people cultivated yacon and attached spiritual significance to the crop, which appears as a motif in pottery and textiles. Nevertheless, the plant did not reach Europe until the 20th century, enjoying brief interest in Italy that soon died out with the Second World War. In the 1980s, New Zealand and Japan became enthusiastic about its nutritional value, where it remains popular to this day. The yacon plant has also been successfully cultivated in Germany, France, and the United States, though the Andean roots are not yet widely popular in these countries. In 1993, yacon was introduced into the Czech Republic from New Zealand and, more recently, it has also been introduced to Russia. THE COMMON NAME FOR YACON IS DERIVED FROM THE QUECHUA WORD "LLAQON", WHICH MEANS "WATERY," REFERRING TO THE RICH WATER CONTENT OF THE ANDEAN TUBER. Although yacon is not as widely known as other tubers, it still generates demand around the world. Japan is the top consumer of the plant, closely followed by Brazil. Commercial cultivation is alive and well in those countries. Peru is the world's top producer, where 18 out of 20 regions of the country cultivate the yacon plant on a large scale, exporting it to places like the U.S., New Zealand, and Korea at a free on board value of US$ 633,000 in 2010 alone. Fodder. The whole yacon roots are sometimes used as livestock fodder for cattle and sheep in local areas of growth.